Reusable ice/heat therapy wrap for pregnant back pain PLUS belly support. Relief from back, hip, round ligament, and abdominal pain. 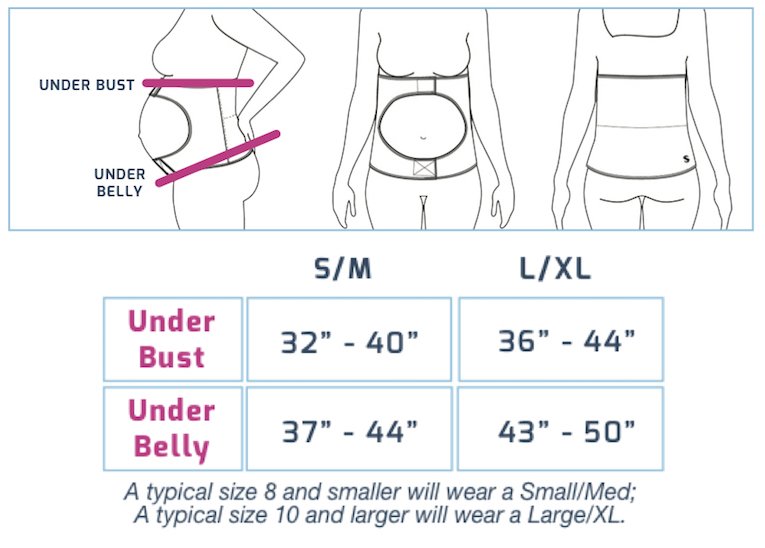 Comfortable, safe, and easy to use belly band designed exclusively for pregnant moms. Spand-Ice has created the ultimate belly band to help you through your entire pregnancy. We combined long-lasting, reusable ice / heat therapy (up to 3 hour of relief), with belly support and adjustability to help you throughout your entire pregnancy. Relieve back aches and pains, support your growing baby and improve your posture with the Spand-Ice Maternity Relief Wrap. SIZING: S/M fits sizes 0 – 8 and L/XL fits sizes 10 – 18. Size up if in between. This is THE wrap for pregnancy back pain. I had tried all the crazy velcro ones and this one is much more comfortable, and actually works. Bonus – you can put heat or ice in the back!! I used to wear a brace and sit back against a heating pad. With the spand-ice you can put the ice or heat packs in it and go! Work, take care of kids, drive, whatever. You also can’t see it under clothes, which I had wondered about. I should’ve bought it months ago! Not only is this a great product, this woman-owned company has some of the best customer service I’ve ever dealt with. If you’re looking for extra back, hip, and ab support, this is it. The bottom band rides low enough to pull the hips and pelvis together and relieve low back pain and pain from pubic symphysis disorder, while the top band adjusts to make wearing super comfortable. I initially had trouble with the fit, but on contacting SpandIce, they customized the bands JUST FOR ME. A purchase worth every penny. Loved the Spand-Ice wrap!! Made active recovery days and doing daily chores so much more comfortable in my third trimester! I absolutely LOVE this wrap! It’s seriously so comfortable and provides the best relief. I keep meaning to order another set of ice packs so I can have two cold and two available to heat. And I think I want to order the postpartum band I just haven’t had the time to do it ha! The Spand-Ice wrap is a lifesaver! I’m a nurse in a busy Emergency Department and after working 12 hours shift of running around my back was killing me!! The Spand-Ice maternity wrap band gives me the support I need throughout my core while lifting patients and meeting the physical needs of my job while being pregnant. The added support takes the pressure off my abdomen and back, while providing the option to add additional comfort of ice and heat! Love this maternity wrap and highly recommend it! I HIGHLY recommend this product to anyone suffering from back pain during the pregnancy. I absolutely LOVE this wrap! Being a stylist and being on my feet all day it gives me such great relief. Even just for an everyday wrap to wear for support without using the heat/cool packs. I’m only 21 weeks so I’m sure I’ll be using this way more as my pregnancy progresses! Thank you Spand-ice for making such a great quality product! I won my spand-ice at an expo and even though I haven’t needed it yet I know I will in the near future. I have tried it on and it feels great. I am 23 weeks pregnant and as my belly gets bigger I notice more strain on my lower back. I can’t wait to use both the ice and heat! As a woman in the dental field, I deal with back pain on the regular. As a pregnant woman in the dental field I was having severe pain after every shift. This band saved my life. Before the maternity relief wrap I was in pain on the drive home from work. A back pain that wrapped around my sides and stabbed my right rib. It was hell. I attended a baby convention and stumbled upon the Spand-Ice booth. The demonstrator slapped one on me and I was in love. The pain melted away. For 6 months I wore it on my drive home. It is the best thing ever. I’m almost sad that I’m not pregnant anymore. I’d recommend this to anyone especially working moms. I wish I had purchased this earlier in my pregnancy. Of course I was too proud and I didn’t think I would need this. And now I can’t imagine surviving without it. If you have any pack pain at all, do not hesitate to purchase it! I’m the mother of the pregnant lady… she is REALLY happy with it, says it saved her life in this last month! I really enjoyed my maternity wrap throughout my pregnancy. I wore it nightly with ice packs to soothe my aching back with my growing belly. At the very end of my pregnancy, the wrap no longer fit. If I get pregnant again, I think I’ll buy the larger size so I can use both and ensure I have comfort through the entire pregnancy. My granddaughter is pregnant and got your Maternity Wrap yesterday. She wore it to work today and I wanted to tell you that she said what a difference it made. Oh my gosh, she should’ve had it a month ago! God bless you for making it and getting it to me as soon as you did. I just want to say thank you. She just loves it. It’s doing a world of good for her. I had the opportunity to be a tester for the new Spand-Ice prototype this morning and am sold! It is extremely comfortable and I noticed a difference in my posture and support as soon as I put it on. As someone who has had three other children and always suffers from back pain during pregnancy, this was such a relief to put on and wear. I plan to wear this postpartum as well. I was also able to try on the other two maternity products that Spand-Ice makes, and just had to buy one for myself. I walked out wearing it and have not taken if off. Thank you, Spand-Ice for creating such a wonderful product! I was hesitant to spend $100 on something I would only use for a few months. But the back pain from my pregnancy left me desperate for relief. So I took a chance and ordered the maternity brace. Oh. My. Gosh. INSTANT relief!! I am SO GLAD I ordered!! I HIGHLY recommend this product to anyone suffering from back pain. I was 30 weeks pregnant when I heard about this product and was suffering from constant lower back and sciatic nerve pain. I was so excited to try out the Maternity Relief Wrap. The wrap has helped tremendously to ease my back pain. It fits comfortably and I love the option to put hold or cold packs in the wrap when needed. This wrap had greatly improved my comfort during pregnancy! I LOVE this thing. I’m currently 16 weeks pregnant so I will have plenty of time to use it! I would give this wrap five stars but the S/M is actually too large for me and there’s no XS option. I don’t think I’m super tiny (5’4″, 120 lbs pre pregnancy) but if you’re on the smaller side talk to customer service before you order! I spoke with the company and they were able to send me some more Velcro; I sewed this on and now it works perfectly. Customer service is super helpful and responds really quickly! After a week I noticed that one of my ice packs was damaged (the seam popped or wasn’t sealed) and they sent me a replacement almost immediately. I have used this wrap almost everyday since I bought it, I’ve used it both with and without the ice packs; it makes my back feel so much better! I highly recommend it!!! I’ve used Spand-Ice for 3 days now and two of those days were working days for me. Let me just say, I LOVE IT! I never realized how hard mopping at work was on my back until I had relief from it while doing the task. The support on my belly is also great. With both pregnancies I have had trouble breathing due to pressure from the uterus but with the support of the band it takes the edge off. My work doesn’t have a freezer so I go in with a mini cooler and use it as needed. In the morning I put the band on, minus the ice packs, so I can do my morning stretches and yoga. I am so greatful to your company for allowing some relief to a crippling ache. I got the maternity relief wrap this weekend and I absolutely love it. The ice pack helps with my back pain. I am 31 weeks pregnant. I never knew how much a brace would help until I got this and the heating/ice pack makes a world of difference and it actually holds the temperature for a long time!! I definitely recommend this product to pregnant women! I was so happy to have this in my life when I was pregnant! It was great to be able to use either heat or cool relief and it was super comfy to wear. Moving around was so easy- getting in and out of the car, putting on a coat. I also appreciated how long the hot/cold pack held it’s temperature. There’s a good chance I’ll be using this again even now that my daughter is born to relieve back pain. Best product out there for back pain for mommas to be! I had excruciating back pain early on in my pregnancy and was convinced I wouldn’t make it through this pregnancy. To cope, I was walking around with an ice pack taped to my back or a heating pad wedged into my work chair. No matter what I did, things would shift and I didn’t have long-term relief. I was miserable. The Maternity Relief Wrap has been a God-send. I am able to ice or heat on the go- especially at work! It has really made a difference in my pain level. I have given brochures to my OB, chiropractor, massage therapist, and physical therapist because I want other mamas to experience this great product. I still have 16 weeks to go and although my pain may come back – I’m ready with my Maternity Relief Wrap. Thank you Helen and the Spand-Ice Team! Ahhh!!! I’ve already worn the maternity pack twice this week!!! I love it!!! The best part is that it stays in place!! I can still be active and go about my daily activities with relief!! Even sleeping, I don’t have to worry about the pack moving!! I highly recommend this product! !